These high quality Network Cables are suitable for a range of home or office networking requirements. Besides being suitable for a local area network (LAN), these cables can also be used with our HDMI extender products. The highest quality internal construction and precision termination will ensure that flawless performance is delivered. 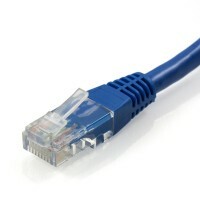 This Cat6 Network Cable is suitable for a range of networking applications throughout the home or office. Featuring a high quality design and termination to deliver superior performance. Features a spring loaded pin to provide a secure connection.